The day was Saturday, 26 August 2011 and I had decided I would get up around sunrise that day and strike out on a new adventure. If you have read some of my previous entries, this flying season I had resolved to land at some airports I had not been to before. 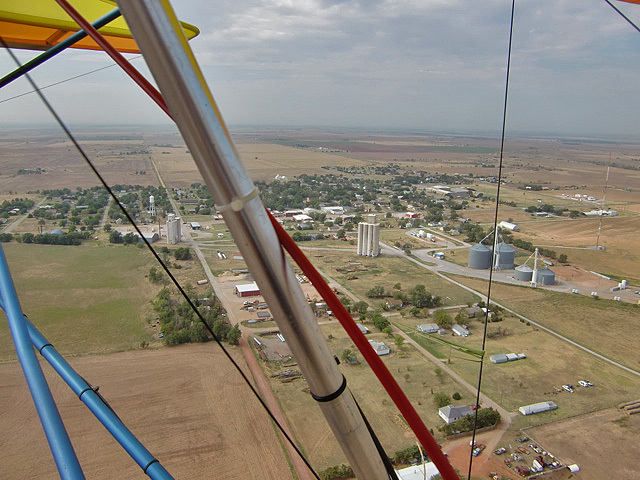 Prior to this about the furthest I had flown was Beaumont, Kansas to the Beaumont Fly-In Hotel and Restaurant. It has been years since the gas station closed down in Beaumont so you have to have enough fuel to make a round trip. On one particularly windy day, headwinds did force us to divert to Augusta Airport on the return trip but that is unusual. 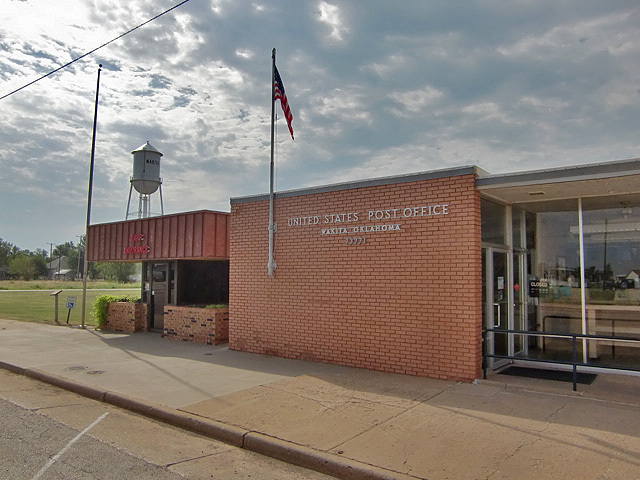 I had resolved over the previous week to go to either Harper, Kansas or Anthony, Kansas. Anthony is a number of miles farther Southwest of my airport than Harper. My primary plan was to go to the farther field (Anthony) and divert to Harper if fuel was running low. I would make the decision in the air. One thing these airports have in their favor is that they have gas available at the field. This eliminated the concern about making it back to my home field on one tank of gas in event of contrary winds. 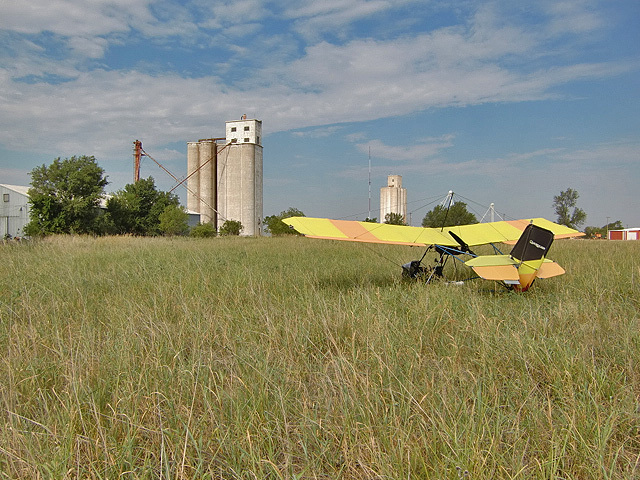 As I preflighted and prepared for takeoff the wind on the field was nonexistent – nil. Unusual for this time of year, though, was a mostly cloudy sky. Earlier, when I arrived at the Aerodrome, I was surprised to find a lot of action. While I call this place “Selby Aerodrome” it is just as much “Selby Stables“. Both Airplanes and Horses live here along with the owner, Susan Selby. Usually when I show up at dawn I’m the only one at the field. 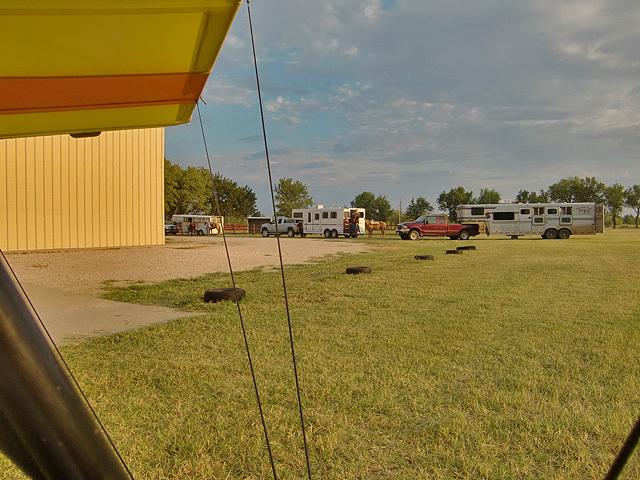 But that Saturday, as you can see in the photo below, there were a number of horse trailers on the lot. I found out there was a horse show and riding competition in the area that day. People had come in from afar to be a part of it. There were actually about 4 times as many trailers as you can see in the picture and a number of folks were out sauntering their steeds in the pleasantly warm morning air. Some were out on the road that traces the tree line to the North you can see in the distance. Because of this I took off to the South at mid runway so as not to risk spooking the steeds. I snapped this as I was taxiing to the active. 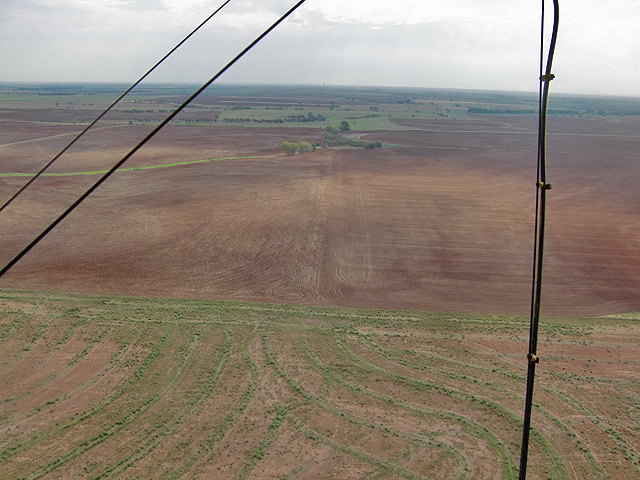 Immediately after takeoff I set my course for Anthony, Kansas. I set my GPS (more on that later…) and actually even brought the pertinent part of a Sectional map to find my way. I never use a map when I fly. I just never need one. Something you might notice from the shot below was the limited visibility. I’m not making excuses. 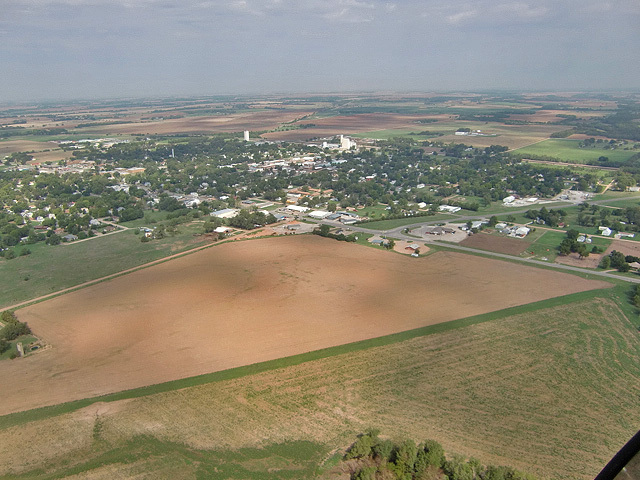 I’m just making an observation… The main reason for the shot below, though, is to show the pleasant little burg named Peck, Kansas. Also we see in this shot that I was able to bag my first train of the day. Peck is special to me as I spent a goodly amount of time shooting sunflower field sequences there a couple of years back for my movie “UFM2“. Prior to getting down low over their fields I approached the owners to make sure they wouldn’t mind. They were all quite helpful and interested in the process. There is more about it here if you want to check. 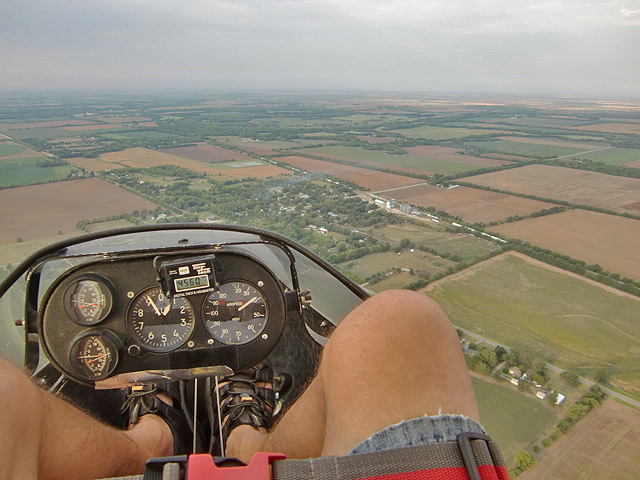 Also in this photo you can tell by my attire it was quite warm and that I was at 900' AGL and that I was cruising at the lowest RPM required to stay airborne. In this case only 4560 (more about that later...). Another part of my flight plan is made evident in the shot below. Because I am engaged in recreational flying, I am not bound by time, place or distance demands on any particular flight. The point of recreational flying is Surf The Sky, to stay airborne as long as possible, and then when necessary alight in pleasant and interesting places. My type of flying is very slow. I cruise at 40 mph. At these speeds even a headwind of 10 mph will make a huge difference in range. Because of that, one of my flight methods is to make trips in a direction “neutral to the winds”. By that I mean if there is any wind (and definitely if it is a 20+ wind) I fly to a destination that keeps the wind hitting the side of my aircraft or what we call a crosswind. That way I am not fighting the wind in either direction of travel. In the photo below you can see by the lilting smoke plume over Peck, Kansas that the weatherman earned his pay that day. Wind direction was as forecast – directly against my left wing. 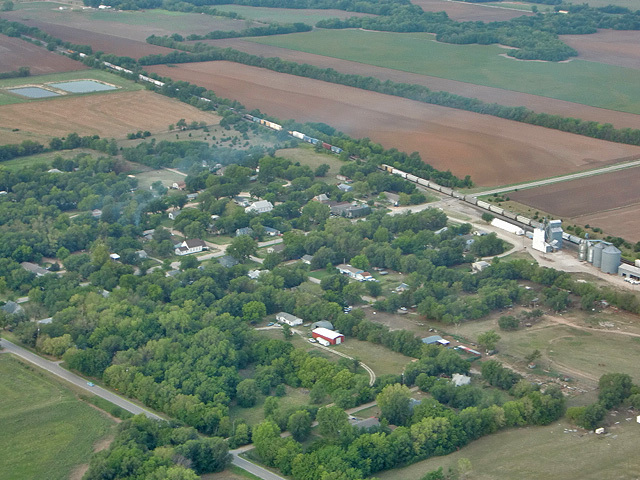 A closer view of Peck, Kansas and the train passing by. 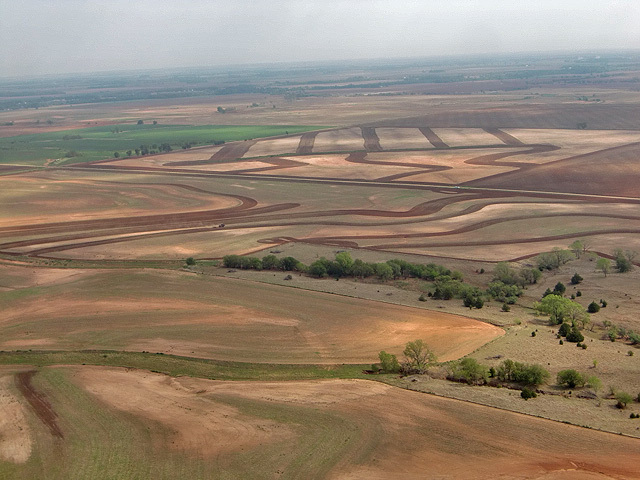 I like the way farmers are so accurate with their tractors as seen in this shot. The lines are perfect parallels. 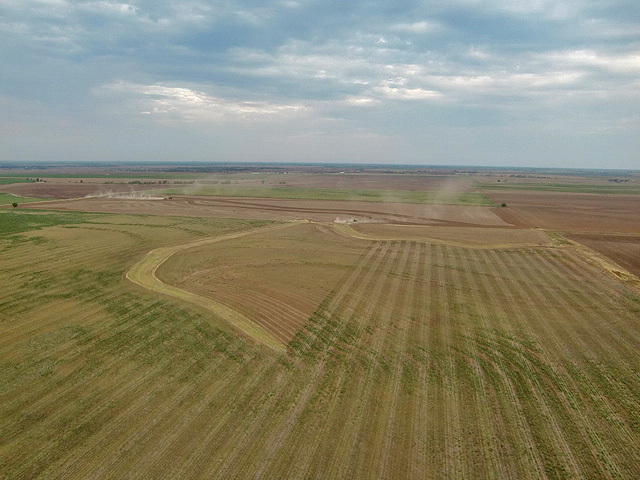 Also if you look in the distance, two tractors can be seen plowing the dirt thereby sending up clouds of dust. When flying, information like this provides me "real time" wind direction info to corroborate with my GPS and aircraft crab angle. The Garmin doesn’t use dashes so I had elected to take a chance that the middle method shown in the above AirNav box might work. So, anyway, I’m just having a great time flying along taking in the sites and getting the best performance out of my plane to date. I showed the tach in an earlier shot. Later I was able to maintain altitude on RPM as low as 4400 for extended periods. It was fantastic. The upshot of this was that I was traveling along seemingly without burning any gas. I was getting a strange sensation of invincibility. I began to embrace the notion that I could stay up indefinitely. It was like I was morphing into one of the red-tailed hawks that inhabit our region. So, I just kept flying. Occasionally I would glance down at the little arrow on my GPS map that said I was heading to Harper, Kansas. It continued to say I was on track so I didn’t much think about it for quite a while. I did notice that the few towns I did pass by were smaller and smaller. Also, these little burgs didn’t even have the requisite water tower displaying their name. I almost started wondering where I was BUT the GPS said I was headed in the right direction. Another reason I wasn’t concerned was because when I looked up at the semi-translucent gas tank that hangs over my head (Yes, 5 gallons of gasoline hangs directly over my head…) I still couldn’t see any air in the tank. Translation: Plenty of gas and I had been flying for about 1 hour and 45 minutes thus far. As you can see in the next shot, though, there were obvious geological signs that a more concerned aviator would have recognized. But, since I had long since merged with the sky and no longer shared the concerns of earthbound beings, my “Eagle Consciousness” could not be bothered with mere time and space considerations. I was flying, the air was perfect, the plane was trimmed to a “T”, the engine was humming like a sewing machine – Everything Was Perfect. Nothing less than the sight of a ground hugging, 600 mph B-1 Bomber with a bead on my nose could shake me out of this flight of fancy. As I stated above, there were visual clues that would have alerted an aviator more concerned about his position on the globe. Hint: The Dirt is Red. After passing the Unknown Town, I flew the GPS arrow another 20 minutes without seeing Harper. I did see a huge oil rig in the distance. Since my wife Debra is a Petroleum Geologist, I take note of these things and shoot pix to show her drilling action I see out on the prairie. This rig started to bring me out of my reverie because I can’t remember having seen one this big in Kansas. Large oil rig AND red dirt. As we get closer, you can see the size of this rig in relation to the known objects like pickup trucks and trailers. This is big for Kansas. 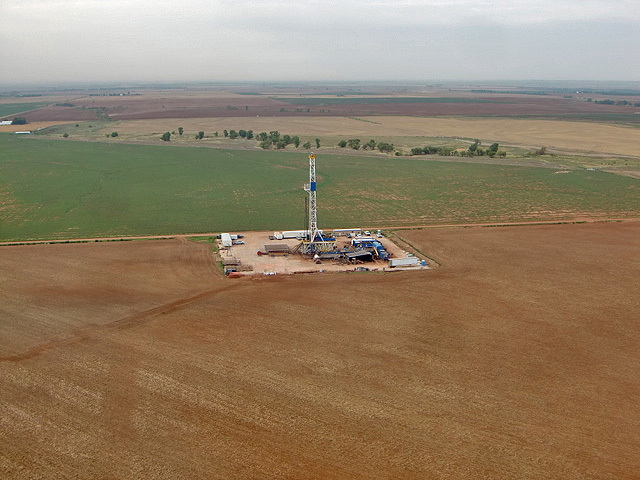 Kansas oil is closer to the surface so the rigs don't have to be as large as this one. The sighting of the large rig and the fact that I hadn’t run into Harper yet was the final wet blanket slap in the face that woke me from my dream state. I spied a town due East and only about 5 miles from the big rig. I could see it had a water tower. I decided to get closer to ascertain the name of the town so I could check it on my sectional map. Waldron, Kansas the place where Tammy Faye Bakker was laid to rest. It turned out to be Waldron, Kansas. I had heard of this place but knew nothing about it. (The interesting trivia bit included in the caption above I gleaned from the internet.) Also while researching, I found out that there are supposed to be only 11 people living in Waldron (Tammy Faye having passed on to a better place). I didn’t see anyone stirring. Not a car, horse, motorcycle or truck either. So, from my visual examination NOBODY lives there… Most importantly at that stage of my flight, neither did I see an airfield or a gas station. 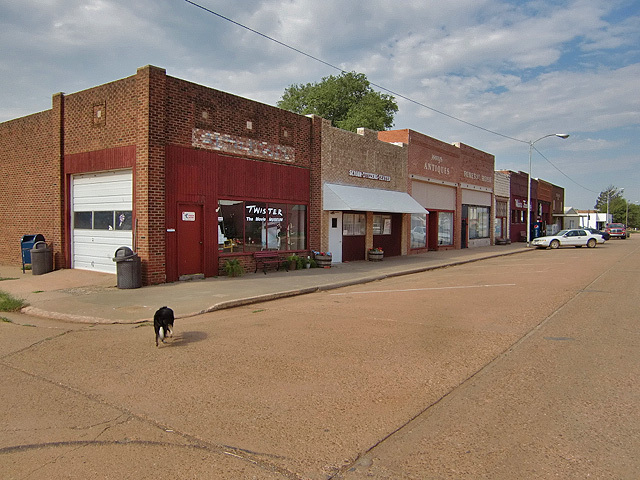 After slowly circling Waldron in a clockwise manner, I saw back to the south a town about 10 miles away. I still hadn’t given up on finding Harper so I was hoping this would be it. By then I had decided the GPS was jerking me around I turned it off and continued my journey sans GPS. Actually my sectional map was not much help either. It was basically impossible to read in the 40 mph wind. I could make out large features but the small stuff was not legible. Regardless, as you read on you will find that not being able to see the map was only part of my problem with the sectional. Finally I came to the scene you see below. 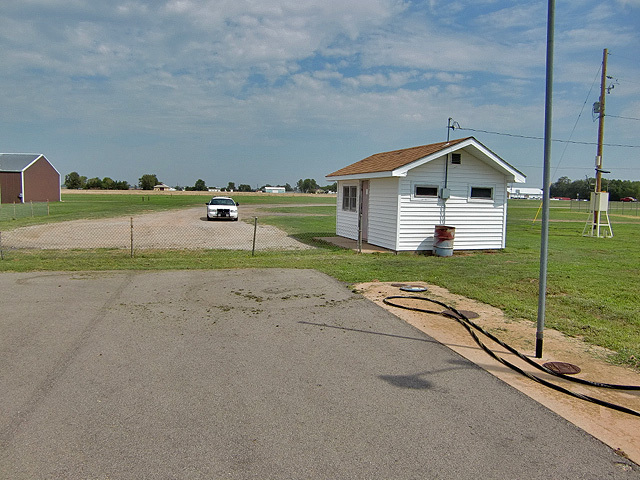 There was a water tower and a self service type gas station on the east side of town right next to a good sized field. Even though I had about a half tank of gas left, the aforementioned criteria (field + gas) filled required blanks in my mental checklist making it an attractive place to alight and get a fix on my location. I made a pass over the field you see in the photo below and determined it to be flat and unobstructed enough to effect a landing. Said landing was smooth and uneventful. Naturally the first thing I had to do after shutting down and climbing out of the seat was to take a picture of the scene. I think it turned out great. Not only does the yellow of my wings play off nicely against the partly blue sky, but you can see the elevators that are close to the center of town in this shot. What you can’t see is the gas station just to the left of the metal building at the far left of the frame. The Quicksilver takes a rest. I walked out of the field. 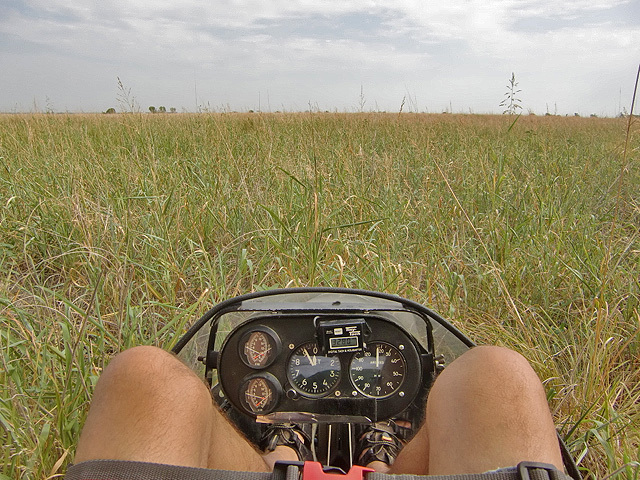 My experience with tall grass prairie fields such as this resigned me to expect at least five chigger bites. I stepped out on main street and there was no one around except the town greeter Buddy. He introduced himself by coming up silently from behind me and nudging my right leg as he swung past me wagging his tail. He really caught me by surprise. Buddy was in constant movement and the shot below was the best of 4 tries to get a shot of his smiling face. Buddy proceeded to show me around the town. He was great company but couldn’t read a sectional. I needed someone to show me where I was on the map. Finally I hailed a fellow exiting his pickup truck to enter Farmers Grain Company to get a tire fixed. I asked him if he could tell me where I was on the sectional I held out to him. Before even looking at it he said, “You must be lost if you’re in Wakita!”. I thanked him for that prescient observation. He peered intently at the map for a moment and then said “You’re off the map. Where were you heading?”. I told him Harper and he pointed back North North West and said “You missed it by about 10 miles”. 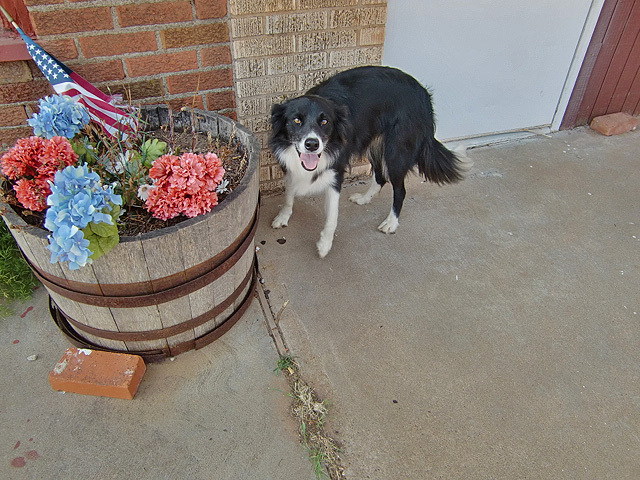 Then in the manner of most farmers I have met, he told me to “go up the road heading north out of town, about 8 miles; when you see the pumpjack at the corner, jog over west for two miles and then head north again and you’ll run right into Anthony. Harper is a little farther”. He wouldn’t let me take a picture of him but I thanked him for setting me straight and walked away. I really love these small towns. They have so much character and history. 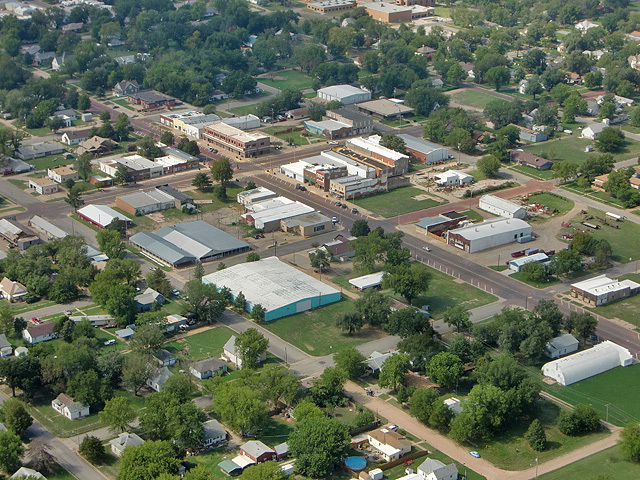 Here is Main Street Wakita, Oklahoma shooting to the South East. 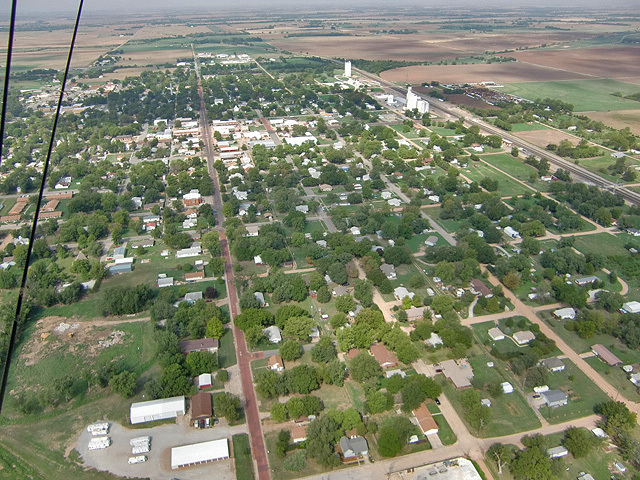 Main Street Wakita to the South West. Buddy had lost interest in me and headed over to the bar for the afternoon Lo Ball game. 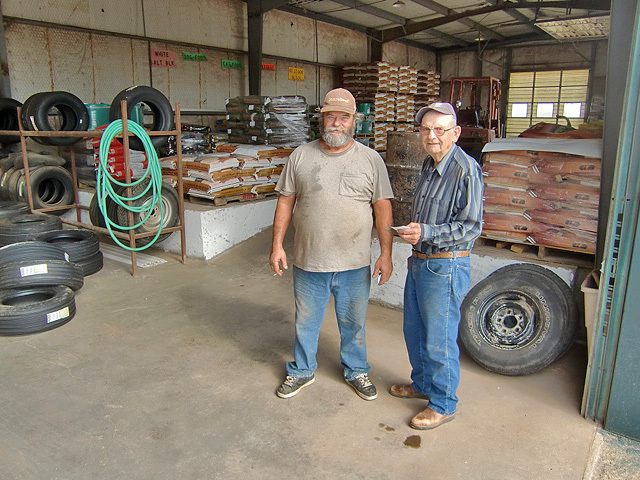 Inside Farmers Grain Company I met Jerry Reese and Herman Conrady. Jerry had seen me fly over and asked me if I was flying a Quicksilver to which I replied in the affirmative. He knew quite a bit about ultralights and asked about the motor and such. I invited him to come over an look at it but he was too busy working and obliged not. Both were intrigued that I had flown all the way from Wichita. Jerry Reese and Herman Conrady at the Farmers Grain Company. From what I had learned from the denizens of Wakita, I was just 10 or so miles off track. I had plenty of gas to make it to either Anthony or Harper. I decided I would make up my mind when I got closer to Anthony. I was still trending toward landing at Harper because I had called the city dispatcher earlier in the week and was certain they have gas at the field. Of Anthony I was not as confident in that regard. Before starting the motor I did a pre-flight to make sure nothing had come loose upon landing. I then walked the area of the field in front of my plane that would be my runway for takeoff. You want to do that to make sure there are no hidden surprises lying await in the tall grass. Both the aircraft and the airfield passed inspection. I saddled up, fired up and climbed once again into the sky. The view from my sparse cockpit just before popping full power. NOTE: In case you "Sharp Observer Types" are looking at my altimeter and thinking I must have landed below sea level - not quite. I alway set my altimeter to be at 0 feet at my home field. I am only interested in AGL (Above Ground Level) Altitude. 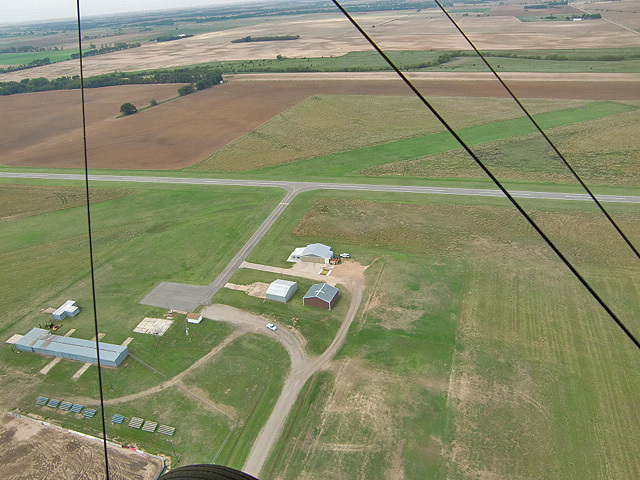 Thus from the picture above we deduce that Wakita is approximately 90 feet lower than Selby Aerodrome. Takeoff was uneventful. The big wings of my MXL allow for excellent soft field takeoffs. Within moments I had cleared the field and was climbing like a banshee. I made a 720 degree right climbing turn so I would stay over the field and could give Jerry Reese a good look at the Quicksilver. I waved Goodbye and headed for Anthony. 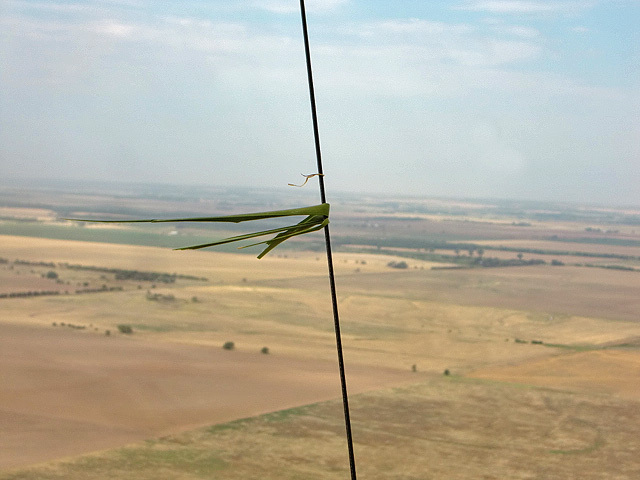 After clearing the area I looked around my plane and noticed a good bit of Wakita's flora had hitched a ride with me. This item on one of my left flying wires hung on for dear life. About 2 miles out of Wakita I saw the huge pond you see below. (Also in the distance of this picture to the upper left you can see another large oil drilling rig and then Anthony, Kansas farther still.) This was the first time I had seen any type of pond like this. I had already gained cruising altitude and did not want to descend and then burn more gas climbing again or I would have dropped down for a closer look. It looked to me like someone had either sprayed some substance or layered a plastic on the bottom of the pond. It was quite large. 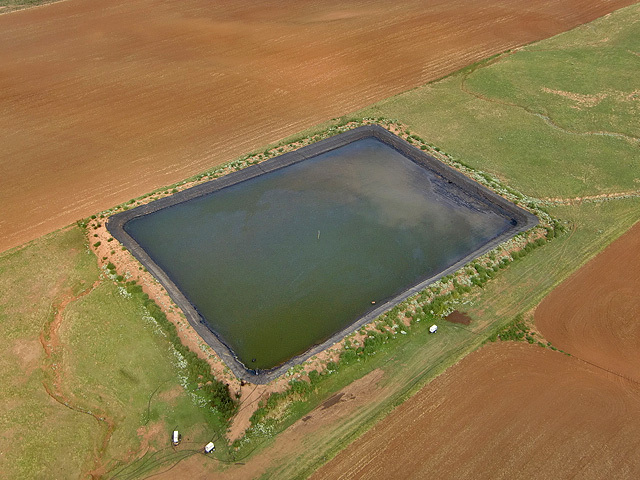 When I have described it to others, they think it was a holding tank for a drilling site. That may be but I saw no evidence of previous drilling. Then again they might have worked real hard to get rid of it. Anyway, no matter what its genesis, it is good to have water out on the plains and it was particularly good to have it this Summer of 2011. 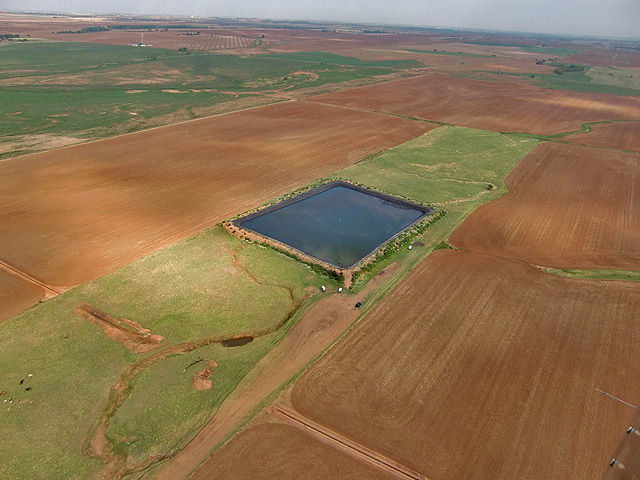 Shooting from the South West from about 1,000 feet we see a huge rectangular pond. 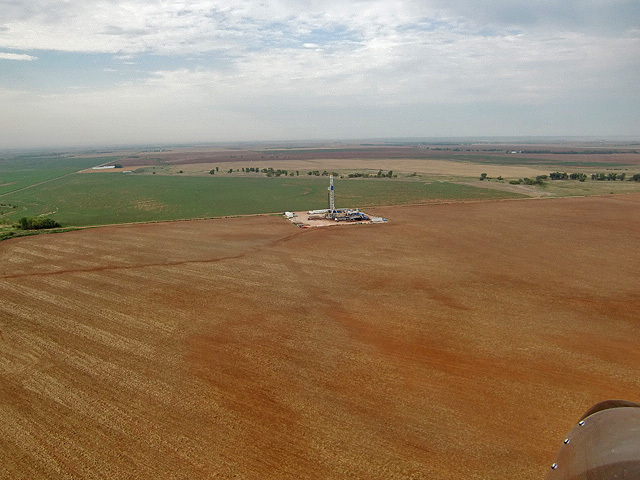 You can also see a large drilling rig off to the North East and then farther off Anthony, Kansas. Note the lack of ripples or waves due to how still the air was. Because of this you can see a sharp reflection of the clouds on the surface of the water. 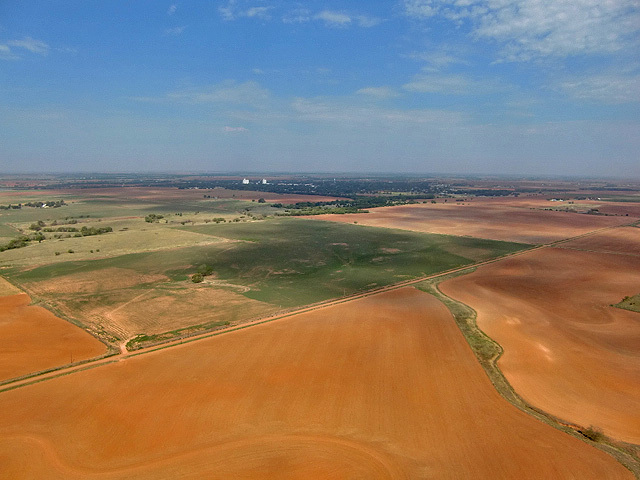 Still over the red dirt of Oklahoma, we approach Anthony, Kansas in the distance. 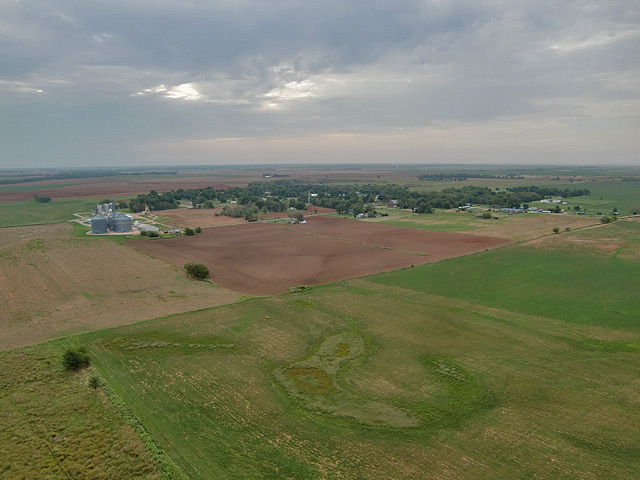 After seeing Anthony in the shot above I decided I would journey on to Harper, Kansas and visit Anthony another time. 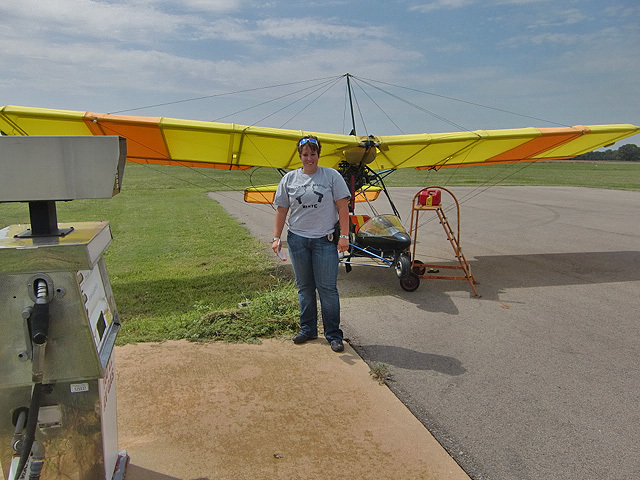 My progress was good, the winds were mild and my fuel was holding out fine. After passing Anthony, I noticed some interesting geometrical shapes off my starboard wing and snapped this shot. After about 20 minutes from Wakita Field, Harper was before me. The following are a few shots as I approached. Harper Municipal is on the South East side of town but rather than head right for it I decided to circumnavigate the town and then land. 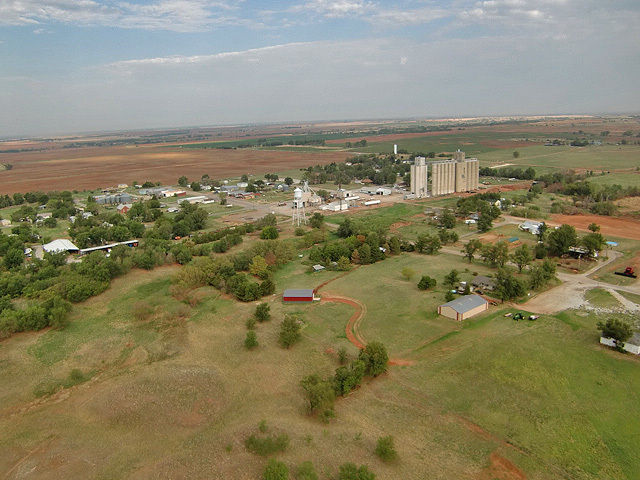 Harper, Kansas from about 1,000 feet and 2 miles South East. 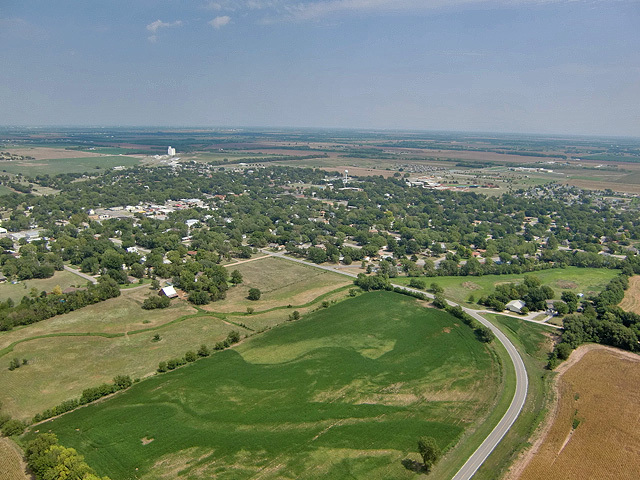 Harper, Kansas from 1,000 feet looking due West from the edge of town. 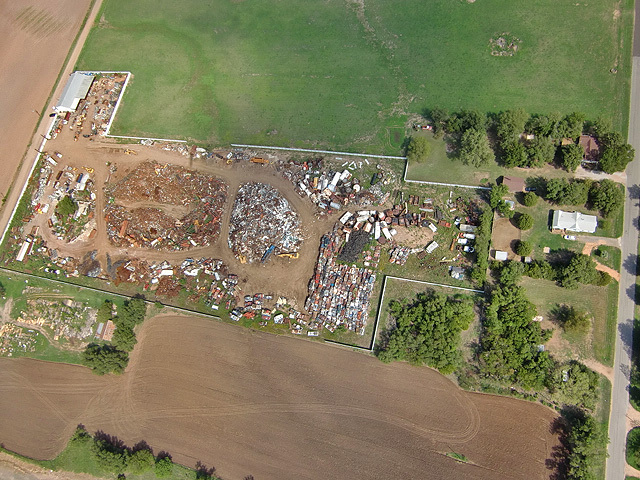 A salvage yard just off the north end of town. Generally you don't notice these things from the ground because they have tall fences around them. I stopped taking pictures as I approached the pattern area of the airport so I could check for traffic. “Big Sky, Little BB’s” is neat and all but the big sky always gets a lot smaller around any airport. I put my head on swivels and looked in all directions. I was the only one in the area. I entered downwind and landed on their grass strip. 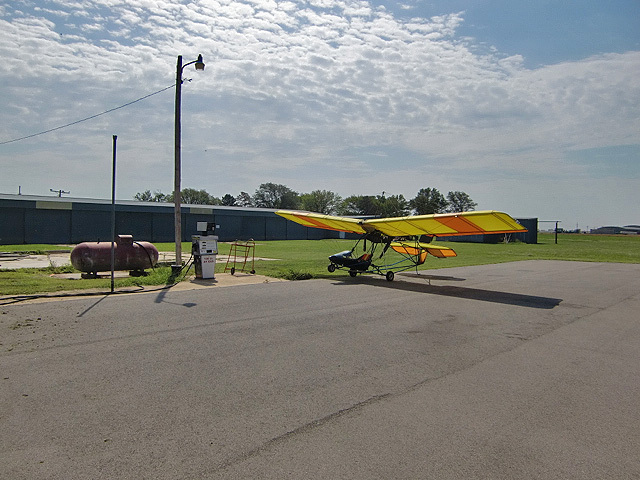 They also have a nice asphalt runway but whenever possible I prefer to land on grass. I tilted the camera down a little more than usual for a shot like this in order to show you how nice the apron is at Harper Municipal. Also notable in this picture is how the light cascades down through the clouds bringing a brilliant shine to the MXL. Harper Municipal has a system for getting gas similar to that of a lot of small town airports. You call a telephone number and the police come over to the airport, unlock the gas pump and take your money. Remember, they don’t make change, though, so you have to round off. Also, don’t bring your American Express (or your Visa, M/C or Discover for that matter). Cash is all they take. You can’t get better service. I went into the pilot shack and called the dispatcher and the police car showed up within about 10 minutes. A police car rounds the turn to park next to the white Pilot Shack. Officer Melanie Miller was tasked with gas pump duty and apologized for making me wait. Man, I’m thinking I have spent longer than that waiting in line at Dillons in Wichita to buy a watermelon. Apparently she had just turned in after a night shift and had to throw on some clothes to handle my deal. I thanked her for the quick response. They didn’t have a gas can for mixing my gas and oil so I carefully measured the oil and poured it directly into my gas tank. That was followed by 4 gallons of 100LL at $4.80 per gallon. Melanie was intrigued that I would drop into Harper and interested in the minimal nature of my plane. I told her to watch how quickly I would get airborne once I put the power to it and that she would be surprised. Officer Melanie Miller - Harper Police Department. She protested that her hair was not up to her standards for taking a picture but I told her she looked fine. Nice girl. I saddled up and took off on the asphalt runway to the South. I didn’t have time to climb higher for a better shot but you get the idea. 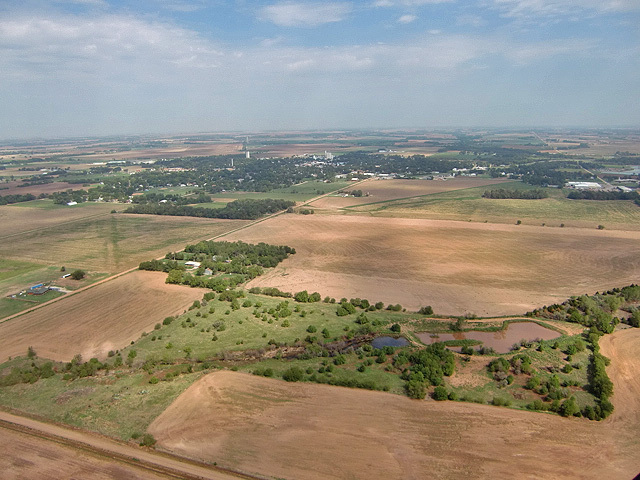 One last shot of Harper, Kansas from about 600 feet North East. After leaving Harper, Kansas I decided to ridge run the rest of the way back to Wichita. Ridge running for me is when I drop down to between 10 and 50 feet above the prairie and cruise. It is one of the most delightful modes of flight ever. It is what the Arabs wished they were doing when they spun myths about flying carpets in ancient times. It is truly a marvelous blessing to be able to drift over the landscape, floating on the wind and thermals, dancing on the wind. And, you don’t need a GPS to do it!